With mesmerising and popular places, like Mussoorie, Nainital, Rishikesh, etc., flooding the stunning state of Uttarakhand, it so happens that small villages like Kanatal often remain less explored. Located on the Chamba-Mussoorie Road and just about 320 km from Delhi, Kanatal is a perfect escape into the arms of nature. With a fantastic landscape of lofty mountains that are spread with lush greenery, orchids and more, Kanatal is a beautiful, secluded destination for those nature lovers who thoroughly enjoy solitude. What's more, the drive from a busy city like Delhi takes just about 8-9 hours to reach the village, making it an ideal weekend getaway. 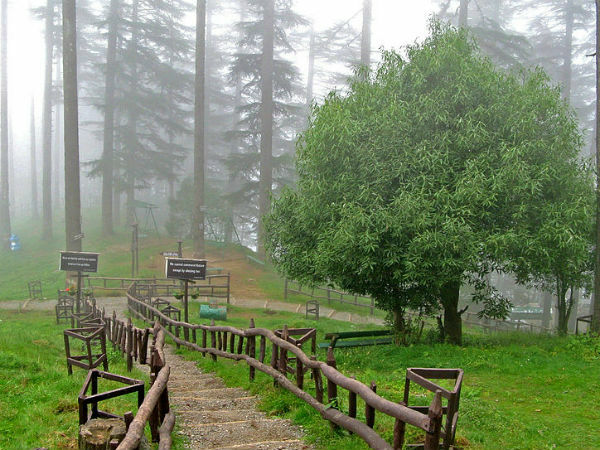 Here are some places you can stop to visit on the way to Kanatal. Muzaffarnagar is a city that is gradually becoming an important industrial hub and is situated about 130 km from Delhi. Sayyid Muzaffar Khan, who was a Mughal commander, founded the city, back in 1633. Visit Vahelna, a hamlet in Muzaffarnagar that has a Jain temple with an enormous and magnificent idol of Lord Parshvanath. Akshay Vat Vatika is another attraction, which is a regal banyan tree, that is centuries old. The twin cities of Haridwar and Rishikesh are located at a distance of about 230 km from Delhi and lie on the route to Kanatal. These holy cities are the most sought-after pilgrimage sites in India. With temples galore and mythologically significant places of interest, a stop at these cities is a must. Some of the places that you need to visit here include Har Ki Pauri, Triveni Ghat, Bharat Mata Mandir, Kunjapuri Temple, to name a few. For the adventure junkies, Rishikesh offers a multitude of exciting adventure activities that you may try. The cities are also popular for having world-class yoga retreats; places that attracts tourists worldwide. Read further to know about the places to visit in and around Kanatal. Kodia Jungle in Kanatal is the ultimate destination for photographers, adventure seekers, nature lovers and wildlife enthusiasts. Here, one may indulge in many activities amidst the secluded nature of wild orchids, stunning landscape and views of the hills and valleys. You can go trekking for about 5-6 km through the jungle, spot animals like ghorals, musk deer while you're at it, camp for a night or click pictures while going on a jungle safari. Settled on an altitude of 9976 ft, the Surkanda Devi Temple is a Hindu temple that is flanked with stunning lush greenery and picturesque views. Here, Ganga Festival is an important event that takes place every year, which falls between May to June. It is also the peak time to visit this temple. Due to the elevation at which the temple is located, a brilliant view of the mighty Himalayas and few cities can be viewed from this point. A quaint town situated at a distance of about 16 km from Kanatal, Dhanaulti is a spectacular place with rich thickets of forests. Walk through the trees of oak, deodar, rhododendrons, etc. in the town. Two eco parks known as Amber and Dhara lie about 200 m away and these parks, which are maintained by the state forest department, are the main attractions of Dhanaulti. Tehri Dam, in the nearby town of New Tehri, happens to be not only the tallest dam in India but also the eighth tallest in the world! The hydroelectric dam nestles at the foothills of the great Himalayas and gets its water from the two rivers, Bhagirathi and Bhilangana. However, the gigantic dam is built across the river Bhagirathi.